The Kiaro QL-120 is the newest member of the Kiaro! colour label printer family, featuring industry-leading print quality, reliability, performance and connectivity. Built on the pioneering Kiaro! 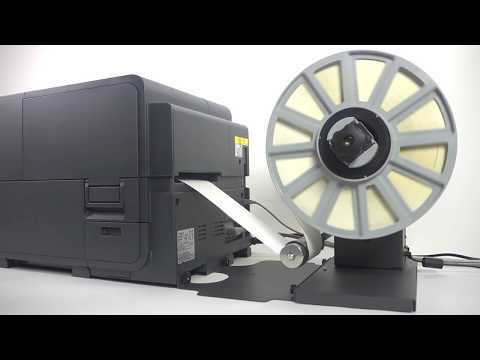 color label printing platform, the Kiaro! QL-120 features enhanced print speed, seamless integration into desktop or enterprise platforms and high-quality colour labels that rival flexographic labels. By taking high-quality label production in-house, the QL-120 eliminates the need for costly preprinted label inventory that usually develops from obsolescence, revisions or regulatory changes. Simple to install and easy-to-use, the QL-120 delivers premium 1200 x 1200 dpi colour labels in an as-needed basis and cost-effective manner. Offering flexible print widths that are unmatched in the industry, the QL-120 enables users to print labels as narrow as 0.5” or as wide as 4.2” on the same device. Every QL-120 also includes one free license to CQL Pro, our advanced labelling software that allows users to effortlessly design, manage and print their own labels. Ideal for: food and beverage, biomedical product, nutraceutical, hardware, e-liquid, personal care products, cosmetic, promotional products labelling and more. The Kiaro!® QL-120 is the newest member of the Kiaro! colour label printer family, featuring industry-leading print quality, reliability, performance and connectivity. Built on the pioneering Kiaro! colour label printing platform, the Kiaro! QL-120 features enhanced print speed, seamless integration into desktop or enterprise platforms and high-quality colour labels that rival flexographic labels. By taking high-quality label production in-house, the QL-120 eliminates the need for costly preprinted label inventory that usually develops from obsolescence, revisions or regulatory changes. Warranty: Each Kiaro! QL-120 comes with a standard One-Year Warranty, excluding wear parts. Telephone and email Technical Support Assistance. An extended 2-year warranty is also available for an additional fee. Customer Support Package: Customer Support Package to extend Kiaro! QL-120 One-Year Warranty. Includes up to one on-site visit (as required), QuickSwap™ Parts Repair & Replacement Service, unlimited telephone and email Technical Support assistance. An extended Customer Support Package for 2 or 3-years is also available for an additional fee. On-site Startup Package: To help you get up and running quickly, a QuickLabel specialist will come directly to your location to setup and install your Kiaro! QL-120, as well as provide training for operation and maintenance. This package also includes one local PC on-site driver and CQL Pro software installation, unlimited telephone and email Technical Support for setup or installation assistance up to 30 days after purchase. External Label Unwinder (UW-5.1) for Kiaro! K-100D.